I always want to know two things before taking a trip: what do I need to pack?” and “what should I wear?” In this post, I thought I would share with you some personal travel tips I’ve picked up during my trips to Hong Kong these past 2 years. I’ll make some quick comments on what to wear, what to bring with you when you’re out and about, and about where to stay. This time, I was in Hong Kong for three days and two nights, and experienced cool and breezy the first day, hot and humid the second and third days. The air conditioning in Hong Kong is arctic. (Some people hate it, but I personally love it. There is nothing like a blast of cold air to cool off ruffled tempers sparked from being overcrowded on the busy streets). However, the humidity and air conditioning makes dressing a bit tricky, because you’re basically preparing for two extreme temperatures. Instead of carting around a cardigan, I find the easiest method is to bring a large, oversized, silk scarf. Silk can be warm in cold temperatures, yet still comfortable to wear in humidity. (This scarf is also handy to have on the plane, because sometime the temperature in the cabin gets quite chilly after takeoff). The humidity also makes pretty much everything look wrinkled. However, I bought these pants from Uniqlo, and they were genius. They have a forgiving elastic waist, pockets AND are wrinkle free! I wore them on the flight and then all day wandering around the streets of Causeway Bay and was perfectly comfortable all day long. Oh, and the elastic waist was perfect, because you can eat A LOT and still feel like your clothes haven’t shrunk a bit XD. I don’t normally wear dresses at all, but at the last minute, I decided to pack this dress from Chinti and Parker that I had bought last season, but have never worn. (Even though I love it, and it makes me happy just to look at it). The dress has a grey, white and navy blue print, and is made out of 100% cotton. It is light and easy to wear, doesn’t show wrinkles, and again, one of the winning features is that it has pockets! Always wear something with pockets when you are travelling in Hong Kong, because then you can stash your Octopus Card for easy retrieval. Trust me, you don’t want to be one of those people, who are holding up the line (or, queue) at the turnstile, fishing into your over-sized tote for that card. 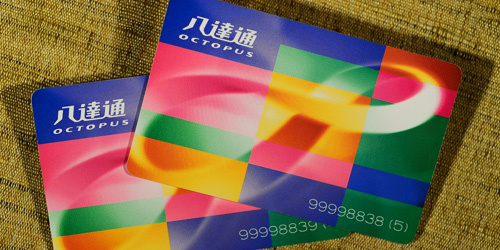 While on the topic of Octopus Cards, buy one. You can get one at the airport kiosk right after you exit the arrivals hall. The Octopus Card can be used on most of the public transportation in Hong Kong (such as the MTR, ding ding trams, and buses) you can also use them at convenience stores and some supermarkets. One other convenient tip I learned if you are shopping at either a convenience store or supermarket is to have all change charged to your Octopus Card. For example, if your total is $20.80, then pay the $20 in cash, and have the $0.80 deducted from your Octopus Card. That way you won’t have to carry around a lot of loose change with you (and you want to get rid of all the loose change before you leave Hong Kong, because the banks won’t exchange them back). My friend and I decided that we would go straight from the airport to the CityGate Outlet Malls, so I wanted to leave my suitcase in a locker. There are two options: one is if you buy something to eat at the airport food hall, then you can leave your bag in a gated area, where someone will watch your bag for you. You have to have a receipt from a restaurant in the food hall, before you can access this area. The second option is the shot term baggage storage area in Terminal 2, Level 3 of the airport. It opens from 5:30 in the morning to 1:30 at night, 7 days a week. it costs $12 HKD per hour, or $140 per day. I ended up choosing this option because it seemed safer. You register your bag at the counter with your passport number, you’re given a ticket, and your bag goes into a securely locked room until you are ready to pick it up again. You need to bring in the ticket and your passport in order to take your luggage out again. I personally prefer this method. In terms of cost, it’s cheaper than buying a meal at the airport, and it seems like a more secure system than the first one. I found that some of the smaller restaurants don’t always provide napkins. At one place, I asked for a napkin, the lady rolled her eyes, sighed, and then produced a box from underneath the counter. To avoid that little encounter in the future, I just bring my own. I like these small packs of 8 by US Baby, they’re chemical free, so sometimes I use them to surreptitiously wipe down the chopsticks and bowls, if they seem a little greasy. I also bring travel packs of Kleenexes, and a small bottle of hand sanitizer and alcohol wipes. To be honest, for convenience purposes, I don’t use a nice cosmetic bag on trips. I usually just pack the items I need in a clear ziplock bag. Another important item to bring with you is a reusable shopping bag. Hong Kong now has an environmental policy in place, where stores charge for shopping bags. It’s a good thing that Taiwan has already had this practice in place for awhile now, so I’m quite used to carrying around a reusable shopping bag in my tote. 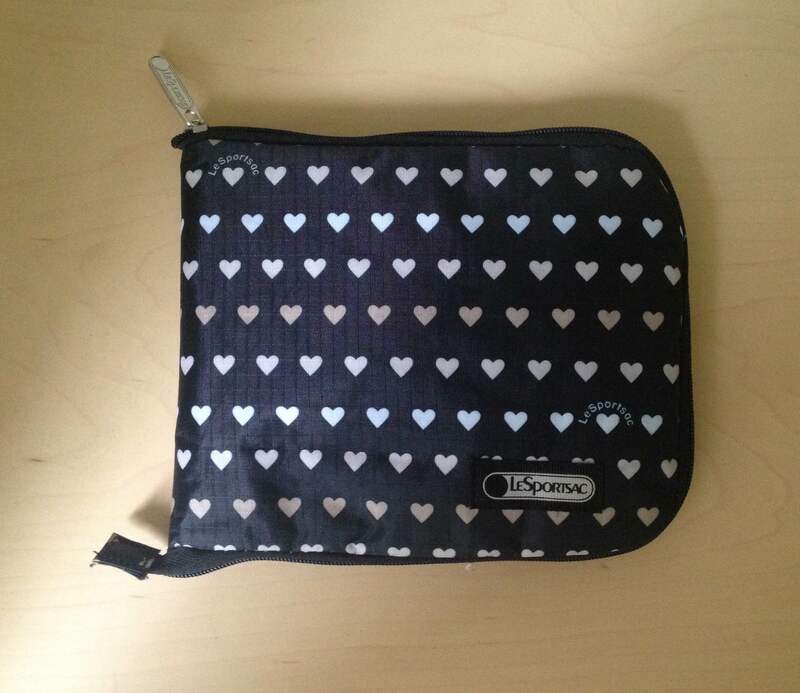 For this trip, I used this fold-able LeSportSac shopping bag , and I was really pleased with it. It folds up into a flat shape, and it also has a zipper, which I found to be quite handy. I also brought along a couple of extra ziplock bags in assorted sizes, in case I bought smaller items. These are lightweight, and will help you stay organized. For example, I bought a handful of pens, and they were just handed to me, without a bag. (It would have driven my batty to have those lovely pens just swimming around in my shopping bag). I learned something new about myself during this trip. Apparently, I can get claustrophobia. I had no idea of this fun little fact until 3 am during the last night of my trip. From now on, I will always remember: don’t scrimp on a hotel room. Size matters! The room that I stayed in looked perfectly fine in broad daylight. 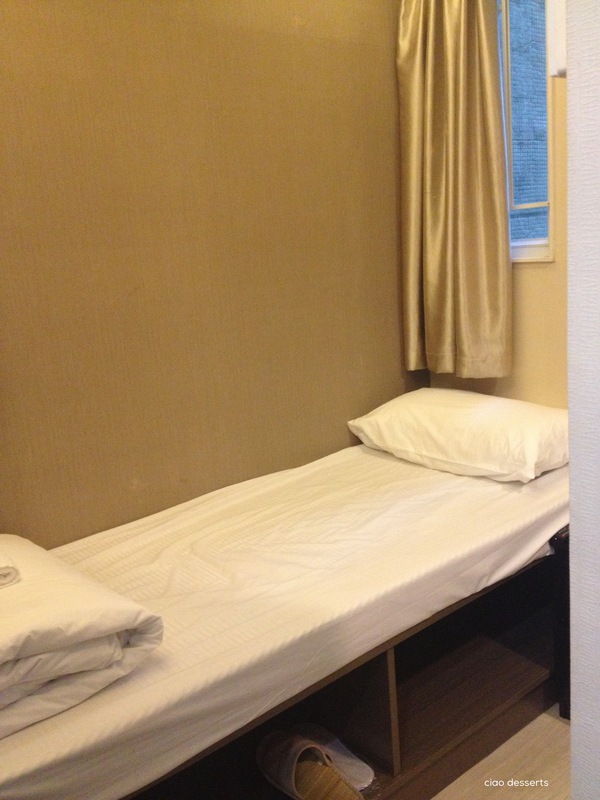 I rationalized at the time that it was okay that the room was incredibly tiny, and that it didn’t (really) matter that I couldn’t open my suitcase all the way, or that there wasn’t a proper shower stall, just a handheld shower spray, because I would only be there at night to sleep. It turns out, all the those things matter!!! And I started to feel the walls close in on me in the middle of the night. I couldn’t even crack open the window to let in some fresh air because the window was roughly the size of an A4 piece of paper, and wouldn’t open more than an inch. So what I ended up doing was turning on my iPad and talking to friends who were in a different time zone. Thankfully, they talked me off the figurative ledge, and I managed to remain somewhat calm until daylight. (Please note that this is a not a negative review about this particular hotel. 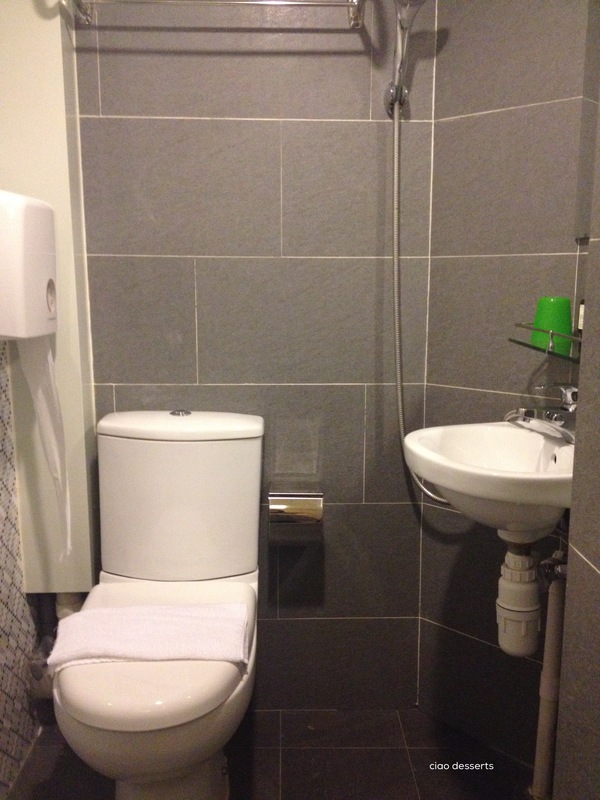 The hotel staff were nice and professional, and it was a perfectly clean, and safe place to stay. But I learned that I need to stay in a reasonably sized room). Aside from that little blip, I had a wonderful time in Hong Kong. This time, I didn’t go to any of the large shopping malls like Harbour City, or Sogo, instead most of our time was spent at places that I hadn’t visited before. I‘ll tell you more about those activities in my next post. This is not a sponsored post. All items were purchased with my own money. Experiences and viewpoints described are my own. This entry was posted in Uncategorized and tagged Hong Kong, organizing, travel, travel tips, wrinkle free. Bookmark the permalink.